Hosts information on the mandate of Hilal Elver, the current UN Special Rapporteur on the right to food, and an archive of the activity of Olivier de Schutter and Jean Ziegler, as former mandate holders, with reports in English, French, Spanish, Chinese and Arabic. This website provides information on the mandate, activity and reports of Olivier de Schutter, the former UN Special Rapporteur on the right to food. The website provides information on the promotion work done by FAO and its partners on the human right to adequate food, including by using FAO’s Right to Food Guidelines. Provides statistics, information and a series of definitions concerning hunger in the world. The WFP is the world largest humanitarian agency. The website provides information about emergencies but also statistics and information on hunger and malnutrition. Host a number of brochures and cahiers critiques in various languages concerning economic, social and cultural rights including the right to food, the right to water, the rights of peasants, and the food crisis. FIAN is an NGO dedicated to combating hunger with human rights. 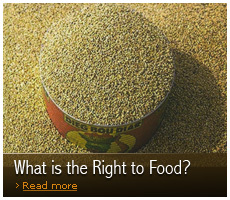 The website provides a large collection of publications and information on the right to food. Oekumenische Kampagne – Brot für alle, Fastenopfer, Partner sein. A campaign of the three organizations which support projects in Africa, Asia and Latin America for the realization of the right to food. An informal network of organizations dedicated to the protection of the right to food in India, based on decisions of the Indian Supreme Court. 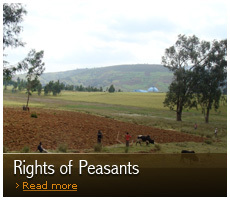 Provides information and publications related to peasant rights and food sovereignty. 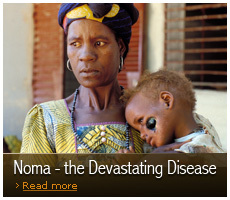 Host information about Noma – the disease. Provides a number of resources and publications related to food policy, hunger, agriculture. Host resources concerning land issues and land rights. Offers training opportunities and publications on economic, social and cultural rights. Disclaimer: The Righttofood.org website is not responsible for the information provided on the above-listed websites.